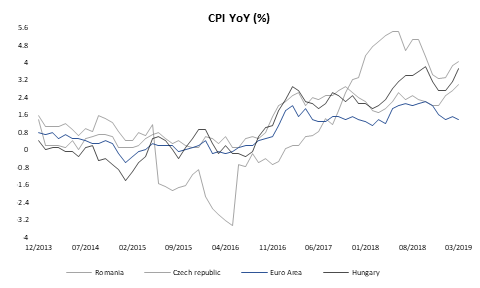 With oil prices rising sharply in the last several months, inflation in CEE has only one way to go and is already approaching higher bound of central banks’ targets. Nevertheless, yesterday’s ECB meeting showed that Mr Mario and co. don’t have any intentions to change their dovish stance, which seems as a headwind to all CEE central bankers that follow ECB but also have their own internal fights. This week we have seen Romania, Czech Republic and Hungary publishing their inflation data for March and seems it surprised forecasters in all three cases. Although there are some similarities in all three countries its worth our while to briefly look at the cases separately and see what their central banks do to fight inflation. Romanian CPI once again increased and stood at 4.0% YoY in March, compared to 3.8% YoY in February and 3.3% in both December 2018 and January 2019. As it was the case in almost all the countries in the region, increase mostly came from increased energy and food prices. In their minutes from the last meeting, NBR Board stated that all major CPI components had posted higher than expected increases and that they expect annual inflation most likely to stay above the upper bound of their 2.5% ± 1.0% target band due to very tight labor market, strong household consumption, increased energy prices and weaker RON. Also, they stated that RON could stay at its historical lows due to the ongoing worsening of external position of Romanian economy with risks tilted to the downside, i.e. they expect RON could weaken even more. Bearing in mind some external risks connected with trade wars and slowdown of biggest trading partners coupled with dovish ECB they decided to leave the key rate unchanged while maintaining strict control over money market liquidity reflecting slight hawkishness from NBR’s Board. In case inflation keeps rising, one shouldn’t be surprised if NBR increases its reference rate once or even twice this year even though external factors weigh to the opposite way. Consumer price index change in Czech Republic on the other hand reached a seven year high of 3.0% YoY. Inflation is now 1.0% above the central bank’s target and we expect central bank at least changing its stance towards more tightening on the next meeting in the beginning of May. Namely, on their last meeting only two of seven members voted for rate hike with slightly dovish stance connected with external factors, i.e. slowdown of euro-zones growth. However, still high levels of EURCZK which bank forecasts at 25.20 in the end of the year, lowest unemployment rate in EU and record high inflation, hike on May 2nd shouldn’t be out of cards. Still, one should have any eye on Brexit talks due to UK being significant trading partner and could negatively affect Czech economy in case of messy exit. Lastly, Hungarian inflation also surpassed analysts’ expectations, reaching multi-year highs of 3.7% YoY in March. However, Hungarian central bankers are not keen to make an U-turn in their policy as it was seen on their last meeting. Namely, they decided to hike its interest rate on deposits from -15bps to -5bps saying that hike was designed to be only one-off. Furthermore, they decided to introduce new measures to stimulate the economy with new unconventional policy in which MNB will buy bonds from non-financial corporations. Due to extremely loose stance, Hungarian Forint is once again trading around 322 levels. Talking about central banks, we should note that yesterday’s ECB meeting was quite non-event with Mr Mario Draghi mostly repeating words from the last meeting saying that TLTRO III is to be introduced and that risks are tilted to the downside, while admitting that inflation should go up in the meantime due to low rates and tight labor market. Well, let’s see about that.